Viper Extreme capsules (New name for Maximuscle Intensity) have a unique high potency formula containing; glucuronolactone, Ginko-Biloba and caffeine, which some experts believe improves concentration, alertness and reaction times. Maximuscle Viper Extreme Capsules also contains LTyrosine, a key excitatory brain amino acid. The Maximuscle Viper Extreme range has reached cult status with everyone that has tried it. Maximuscle Viper Extreme capsules are ideally suited to athletes performing events from short sprints to marathon running, as well as bodybuilders and gym users, looking to stay alert, focused and maximise their training. Maximuscle Viper Extreme is so popular it is even used by those who have to keep alert and focused whilst working late, driving on long journeys or going clubbing. Just take 2-3 Maximuscle Viper Extreme capsules and you'll feel it working within 15-20 minutes. Viper Extreme capsules incorporate the very latest in smart nutrients and neurotransmitter precursors. If you need to focus on training after a hard day at work, you will be very impressed by the effects of Viper Extreme. 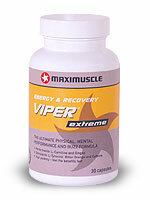 Depending on bodyweight, take 2-3 Viper Extreme capsules 20-30 min's before training, dancing or late night driving. Avoid taking before bedtime as insomnia may occur. You�ll feel Viper Extreme Capsules work within 15-30 minutes, after taking just 2-3 capsules. Do not exceed 6 capsules per day. Do not take every other day.